Jerry Glanville was right. Pro football is the No Fun League. Unfortunately, that mentality extends to college football, too. Thus, Chris Nelson’s belly-rubbing days are likely over. 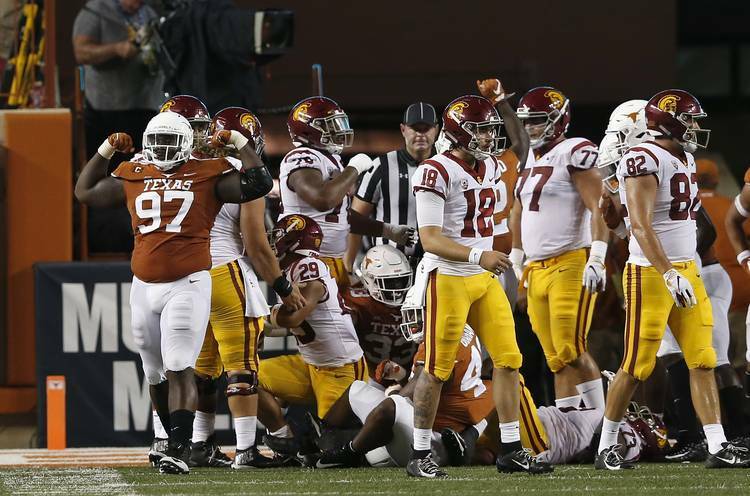 The burly Texas defensive tackle jumped up after a tackle against USC, arched his back and rubbed his stomach in celebratory fashion. Then he did it again during the TCU game. Ironically, the Texas Tummy Rub happened on two consecutive plays. Linebacker Gary Johnson made a big stop, jumped up and rubbed his belly, too. One of the game officials immediately saw it, ran and got in Johnson’s face and the senior hustled back to the huddle. Then Nelson did his on the next play but appeared to get away with it. College football’s overlords — i.e. game officials — should welcome such harmless fun. The whole team should do it. The players on the sideline should do it. Heck, every Texas fan in the stands should do it, too. “That’s what I’m trying to get to — the whole stadium,” Nelson said. Nelson said defensive coordinator Todd Orlando told him to knock it off. Every tummy rub might be a 15-yard penalty for unsportsmanlike conduct. So that makes two things Texas now has to confine to the video board. The first is a loud wolf howl whenever safety Caden Sterns makes a big play. The second is a replay of the Nelson belly rub. No let down or overlooking K-State from this team. Finally, I believe these guys have the right coaching staff to prepare them mentally and physically. They appear to be on a mission to prove that they are contenders. Hook ’em! Winning is contagious. The most impressive thing about the last two weeks was how Texas won. Against USC, there was an interception, a goal-line stand, a dynamite touchdown catch in the back of the south end zone. Then against TCU, the Horns forced four turnovers and made two sensational touchdown catches. These were all highlight-reel level plays, not flukes by any stretch. Some fans may be emotionally afraid to buy in, but I’m here to tell you, this does feel different from anything in the last four seasons. Texas is now ranked and actually favored to win in Manhattan. If you want to wait one or two more weeks before jumping on the bandwagon, I totally understand. That would be great if we could get the W and have some great momentum going into the Red River rivalry against Blow U.
I’m shocked — shocked!! — that any Texas fan would take Oklahoma’s name in vain. Nah, not really. You know, OU didn’t look so hot this past weekend against Army. But give some credit to the Cadets. Coaches hate preparing for the triple option, an offense designed to create confusion and run the clock. It’s difficult to prepare for in six days. Back to your question, though. If Texas can beat K-State this weekend, the Horns would be 4-1 going into the Cotton Bowl. If OU holds up its end of the bargain this weekend against Baylor, that should make for one hell of a matchup. How much does it take to keep Orlando next year? At least 2 million? Will Chris Del Conte sign off on that price? I don’t know what Herman’s thinking, but I’m operating under the assumption that defensive coordinator Todd Orlando will be gone after this season. I don’t think any amount of money would keep him here. Well, if you paid him like a head coach (at least $3 million annually) then that changes things. But no assistant coach is worth that. And let’s be clear, Orlando will be a head coach someday. He’s got the tools and temperament. Here’s something to remember: There’s nothing wrong with making $2 million as the defensive coordinator of a top-25 program. There’s not as much pressure as the head coach, and you still make plenty of dough. I hate the black socks. Really? I don’t. Love it with the home uniforms. The Horns will stay with white shoes and socks with their road uniforms. Why does Kris Boyd keep receiving praise when he is beat every play and just gets lucky? I’m not totally sure it’s all luck. Boyd was a preseason All-Big 12 pick for a reason. You think that was luck how he punched the ball out of Jalen Reagor’s hands in the south end zone last week? I thought that was talent. OK, so maybe he got burned, but he didn’t. Was that luck or talent when he knocked down a touchdown pass in the north end zone? Was that luck or talent when he made the sky-high leap along the USC sideline for that interception? Playing cornerback at any level is difficult. Yes, you will get beaten at times. Short memories are a must. If coaches held a vote right now after just four games, I’m guessing Boyd would be a first-team All-Big 12 selection. Why does Texas call plays with quarterbacks rolling left and throwing across their body? Set gives defensive backs time to adjust, weaker throws etc. What am I missing? Honestly, I’ve wondered that myself with right-handed quarterback Sam Ehlinger. Of course, any coach or offensive coordinator will say that you can’t eliminate half the field with the play design. Good quarterbacks should be able to handle that situation you describe. There were times last year when Ehlinger rolled to his left and was forced to throw across his body. Go see how the final play against Oklahoma State turned out. If you’ve got Peyton Manning back there, sure, go for it. And while we’re on the topic of play design, why did Texas run a pitch play and ask their short-yardage back (Daniel Young) to get around the corner of a lightning-fast TCU defense on the short side of the field on fourth down? Herman said Orlando was barking in the headphones to go for it. OK, fine. But it’s not better to run that to the wide side of the field? Hey, I make the little bucks, not the big bucks. Our secondary is already pretty much set for the next couple years with Caden Sterns and B.J. Foster. The more the better, but let’s go get some blue chip offensive linemen. People wonder why Alabama and Ohio State are repeatedly top-5 teams. Their O-Lines are ridiculous!!!! This was in reaction to Monday’s news about four-star safety Tyler Owens. He’s the 17th member of the 2019 recruiting class. Our recruiting writer Mike Craven believes Owens is a raw talent who needs to be molded. I get the fans’ frustration about recruiting linemen. So far, I count only two offensive linemen in next year’s class — Tyler Johnson and Javonne Shepherd. This wouldn’t be a problem if Texas had been able to hang on to their offensive line recruits from previous years. But players left, some had bad luck and others just weren’t all that good. You should try to stockpile as many linemen as possible. Guys like Calvin Anderson don’t fall into your lap every summer. Why does Beck always line up in the slot when we have many speedsters like Joshua Moore and Devin Duvernay that could be more of a threat? You’re probably referring to one or two specific play formations. I don’t see Beck lining up in the slot on a regular basis. That’s not his job, per se. Then again, the definition of the tight end is dramatically different these days. For example in Lubbock, I don’t think the “tight end” lines down as a blocker much at all. At least the last few games, it appears the coaches are finally playing their best players and going away from this participation ribbon approach. That’s why Lil’Jordan Humphrey has 21 catches and Collin Johnson has 20. Beck has six catches so far, one shy of tying his career high set in 2015. Even he’s surprised at that. “I’ll take it,” he said. Finally, a quick basketball item. Did everyone see this photo of Jericho Sims that was posted on the Texas basketball Twitter account? He’s practically changing the light fixtures. Practice begins officially this week. Coach Shaka Smart said the Horns will have some sort of Texas Tip-Off event at Gregory Gym, although the dates are still being finalized.